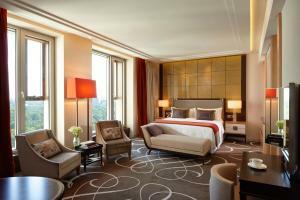 The elegant rooms at the Waldorf Astoria feature large flat-screen TVs with an in-room entertainment system. They provide panoramic views of the city, and have floor-to-ceiling windows. The upper floors have Berlin's highest suites and some have their own private terrace. ROCA offers light seasonal and Mediterranean cuisine, featuring small plate dishes with a rustic, home-cooked feel. A large selection of the menu can also be enjoyed as takeaway. Drinks can be enjoyed in the Lang Bar. A range of beauty treatments and massages can be booked in the Guerlain Spa, which also features an indoor pool. Active guests will benefit from the modern fitness room. There is a library on the 15th floor with stunning panoramic views of the city. Berlin Central Station is a 8-minute drive from the hotel, and Tegel Airport can be reached by car in 40 minutes. Please note there is an additional charge for using the spa facilities. Please note that the Library Lounge will be closed due to maintenance work between 02 January and 25 January 2019. 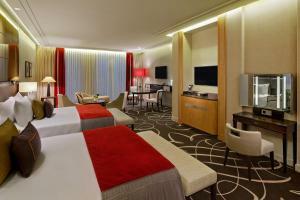 Luxurious room featuring a 40-inch flat-screen TV with Apple TV technology and a Nespresso coffee machine. A daily newspaper and a free bottle of water come as standard. Offering excellent city views, this luxurious room features a 40-inch flat-screen TV with Apple TV technology and a Nespresso coffee machine. A daily newspaper and a free bottle of water come as standard. 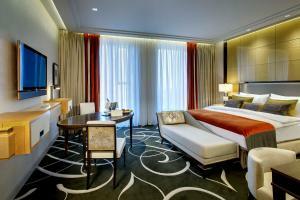 Luxurious junior suite featuring a marble bathroom with separate shower and toilet. Consists of combined living room and bedroom areas. 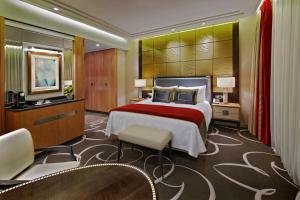 Highlights include a Nespresso coffee machine and a 40-inch flat-screen TV with Apple TV technology. A daily newspaper and a free bottle of water come as standard. Featuring 180-degree views of Berlin, this luxurious and spacious suite has a marble bathroom accessible from both sides. Consists of combined living room and bedroom areas. 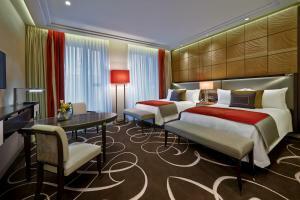 Highlights include a Nespresso coffee machine and a 40-inch flat-screen TV with Apple TV technology. Fresh flowers, a daily newspaper and a free bottle of water come as standard. WiFi is free in this suite. 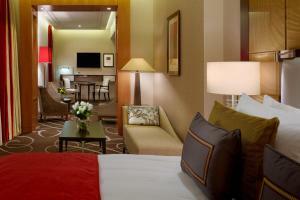 Luxurious room featuring a 40-inch flat-screen TV with Apple TV technology and a Nespresso coffee machine. A daily newspaper and a free bottle of water come as standard. 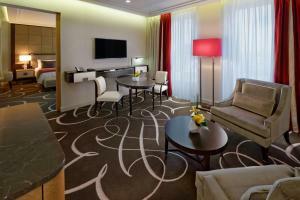 Situated on the 23rd to 25th floor, this room features a 180 degrees view of Berlin City-West. WiFi is free in this suite. 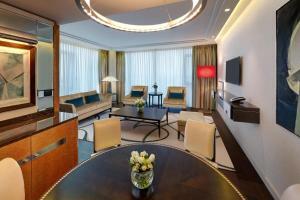 Luxurious room featuring a 40-inch flat-screen TV with Apple TV technology and a Nespresso coffee machine. A daily newspaper and a free bottle of water come as standard. 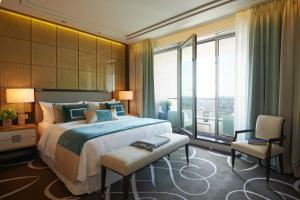 Situated from the 22nd to the 29th floor, this room features a 180 degrees view of Berlin City-West. WiFi is free in this suite. 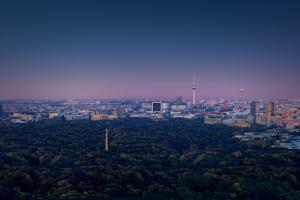 Located on an upper floor, overlooking the Kaiser-Wilhelm Memorial Church or Berlin Zoo. Featuring a combined sleeping and living room, a marble bathroom with underfloor heating and separate bath and shower, as well as a television in the bathroom mirror. The bedroom has a king-size bed, floor-to-ceiling windows, a 40-inch flat-screen TV, a private bar, a Nespresso coffee machine and luxury bed linen. 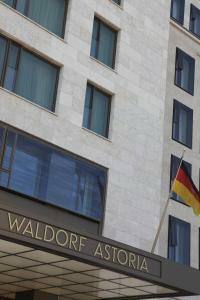 Located on an upper floor, overlooking the Kaiser-Wilhelm Memorial Church or Berlin Zoo. Featuring a marble bathroom with underfloor heating and separate bath and shower, as well as a television in the bathroom mirror. The bedroom has two single beds, floor-to-ceiling windows, a 40-inch flat-screen TV, a private bar, a Nespresso coffee machine and luxury bed linen. 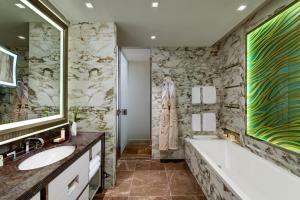 This suite features a combined sleeping and living room, a marble bathroom with underfloor heating and separate bath and shower, as well as a television in the bathroom mirror. 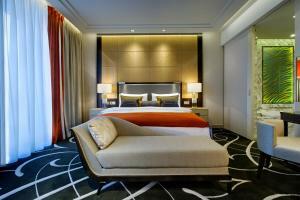 The bedroom has floor-to-ceiling windows, a 40-inch flat-screen TV, a Nespresso coffee machine and luxury bed linen. 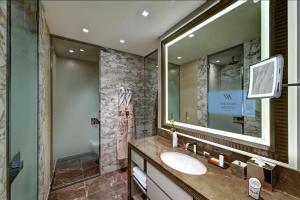 Featuring a marble bathroom with underfloor heating and shower, as well as a television in the bathroom mirror. The bedroom has a king-size bed, floor-to-ceiling windows, a 40-inch flat-screen TV, a private bar, a Nespresso coffee machine and luxury bed linen. This suite has a satellite TV, electric kettle and bathrobe.